From the 10th century on, angelica was cultivated as a vegetable and medicinal plant, and achieved popularity in Scandinavia in the 12th century and is still used today, especially in Sami culture. Angelica is a shamanic medicine among the Saami or Laplanders. A flute-like instrument with a clarinet-like sound can be made of its hollow stem. Linnaeus reported that Sami peoples used it in reindeer milk, as it is often used as a flavouring agent. In 1602, angelica was introduced in Niort, which had just been ravaged by the plague. It is used to flavour liqueurs or aquavits, (e.g., Chartreuse, Bénédictine, Vermouth, and Dubonnet), omelettes and trout, and as jam. The long bright-green stems are also candied and used as decoration. Angelica is unique amongst the Umbelliferae for its pervading aromatic odour, a pleasant perfume entirely different from fennel, parsley, anise, caraway, or chervil. It has been compared to musk and to juniper. Even the roots are fragrant, and form one of the principal aromatics of European growth - the other parts of the plant have the same flavour, but their active principles are considered more perishable. 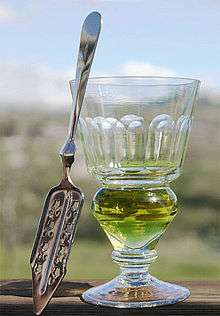 The fruits are tiny mericarps and are used in the production of absinthe and other alcoholic drinks. Seeds of a Persian spice plant known as Golpar (Heracleum persicum) are often labeled as "angelica seeds". 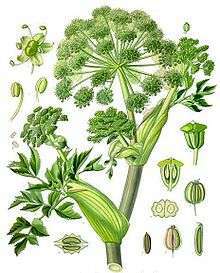 Angelica archangelica roots have been used in the traditional Austrian medicine internally as tea or tincture for treatment of disorders of the gastrointestinal tract, respiratory tract, nervous system, and also against fever, infections, and flu. John Gerard's Herball praises the plant and states that "it cureth the bitings of mad dogs and all other venomous beasts." A. archangelica contains a variety of chemicals. The essential oil of the roots of A. archangelica contains β-terebangelene, C10H16, and other terpenes; the oil of the seeds also contains β-terebangelene, together with methylethylacetic acid and hydroxymyristic acid. Several coumarins, including 2′-angeloyl-3′-isovaleryl vaginate, archangelicin, oxypeucedanin hydrate, bergapten, byakangelicin angelate, imperatorin, isoimperatorin, isopimpinellin, 8-[2-(3-methylbutroxy)-3-hydroxy-3-methylbutoxy]psoralen, osthol, ostruthol, oxypeucedanin, phellopterin, psoralen and xanthotoxin, can be isolated from a chloroform extract of the roots of A. archangelica as well as several heraclenol derivatives. The water root extract of A. archangelica subsp. litoralis contains adenosine, coniferin, the two dihydrofurocoumarin glycosides apterin and 1′-O-β-d-glycopyranosyl-(S)-marmesin (marmesinin), 1′-O-β-d-glucopyranosyl-(2S, 3R)-3-hydroxymarmesin and 2′-β-d-glucopyranosyloxymarmesin. Archangelica comes from the Greek word "arkhangelos" (=arch-angel), due to the myth that it was the archangel Michael who told of its use as medicine. 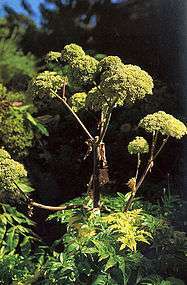 In Finnish it is called väinönputki, in Kalaallisut kuanneq, in Northern Sami fádnu, boska and rássi, in English garden angelica, in German Arznei-Engelwurz or Echte Engelwurz, in Dutch grote engelwortel, in French angélique, in Persian Sonbol-e Khatāyi سنبل خطایی, in Swedish kvanne, in Norwegian kvann, in Danish kvan, in Icelandic hvönn, in Polish arcydziegiel, angelika, dzięgiel lekarski, dzięgiel wielki, anielskie ziele, archangielski korzeń, anielski korzeń, and in Faroese it has the name hvonn. ↑ http://www.botanical.com/botanical/mgmh/a/anegl037.html | Ed Greenwood 1995, Electronic version of A Modern Herbal: The Medicinal, Culinary, Cosmetic and Economic Properties, Cultivation and Folk-Lore of Herbs, Grasses, Fungi, Shrubs & Trees with their Modern Scientific Uses, by Mrs. M. Grieve, first published 1931. ↑ Gualtiero Simonetti (1990). Stanley Schuler, ed. Simon & Schuster's Guide to Herbs and Spices. Simon & Schuster, Inc. ISBN 0-671-73489-X. ↑ Grieve, Maud (1971). A Modern Herbal: The Medicinal, Culinary, Cosmetic and Economic Properties, Cultivation and Folk-lore of Herbs, Grasses, Fungi, Shrubs, & Trees with All Their Modern Scientific Uses, Volume 1. p. 39.